The ILX-27 unmanned helicopter is built of composite materials. Image courtesy of Institute of Aviation. A model of ILX-27 air vehicle seen during the MSPO 2014 International Defence Industry Exhibition. Image courtesy of Institute of Aviation. The ILX-27 rotorcraft features shrouded tail rotor. Image courtesy of Bin im Garten. The ILX-27 helicopter has a three-bladed main rotor. Image courtesy of Institute of Aviation. The ILX-27 unmanned helicopter is intended for military, civil and special operations forces. It is indigenously developed by a consortium comprised of Institute of Aviation in Warsaw, the Military Aviation Works No. 1, and Polish scientific and research organisation Air Force Institute of Technology (AFIT). 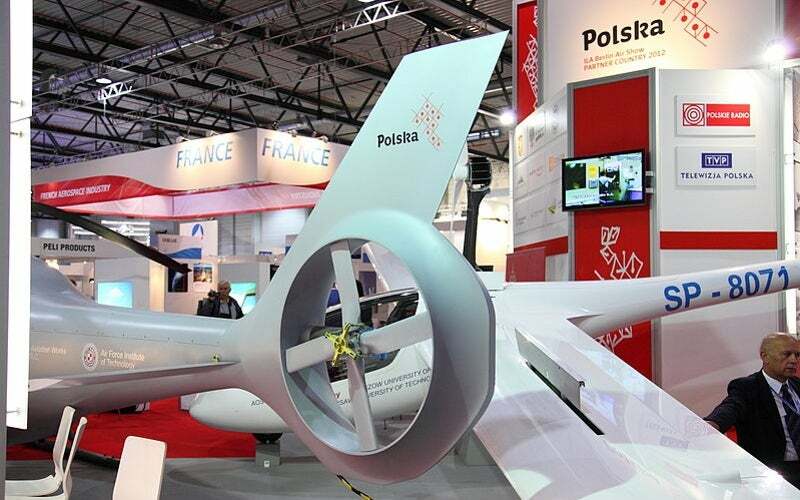 The rotorcraft was first unveiled at the Berlin Airshow ILA 2012 and its first prototype underwent a series of flight tests conducted by the National Centre for Research and Development (NCRD) in remote-control mode of operation in September 2012. A prototype was exhibited during the Helicopter Expo and Conference (Helitech Expo) held in London, UK, in October 2013 as well as in the Balt-Military-Expo held in June 2014. It also took part in the 23rd International Defence Industry Exhibition (MSPO) held in September 2015 in Poland. The ILX-27 helicopter can be used by the armed forces in missions such as search-and-rescue, aerial reconnaissance, evacuation of soldiers and their equipment from areas at risk, and transportation of precision weapons, military equipment, ammunition and medical supplies to the combat areas. Its civil missions include fisheries protection, damage assessment, fire-fighting, emergency services, geology, cartography, and monitoring of forests, engineering facilities, bridges, communications, agricultural and railways. The helicopter also supports the police and border guard-related missions. The ILX-27 unmanned rotorcraft features modular design and lightweight structure, and is built using composite materials. It has a three-bladed main rotor and a shrouded tail rotor with five blades. It is fitted with a skid type landing gear, which can sustain landing with g-forces of 5g and meet energy absorption requirements. The main rotor blades, made from carbon and composite materials, allow the helicopter to perform missions at low altitudes as well as in different aerodynamic conditions. A vertical stabiliser, placed at the leading edge of the tail rotor, provides directional stability. The total length of the ILX-27 is 7.74m and the height is 2.73m. With a maximum take-off weight of 1,100kg, the unmanned helicopter is capable of carrying payloads weighing up to 300kg. The vertical take-off and landing (VTOL) capability enables the rotorcraft to take-off and land vertically from unprepared areas. The fuselage is attached with two fixed wings with weapons carrier platform to carry different types of weaponry including unguided rocket pods and 7.62mm-calibre guns. Its modular design allows for easy configuration to accomplish specific mission requirements. The ILX-27 air vehicle can be equipped with a payload pod under the nose for carriage of a variety of optical and advanced observation sensors as well as electronic systems. "The unmanned helicopter is capable of carrying out missions in difficult terrain conditions such as urban areas, mountains and areas threatened by enemy fire." The rotorcraft has the ability to operate in remote and / or an autonomous mode while performing missions. In the remote-control mode, it is controlled by its operator from the ground control station. An autonomous control system on-board the ILX-27 provides autonomous flight capability. Driven by a Lycoming IO-540 engine rated at 260hp, the ILX-27 can fly at a maximum speed of 215km/h and over a range of 441km. It can reach up to an altitude of 4km and climb at a maximum rate of 10m/s. The unmanned helicopter is capable of carrying out missions in difficult terrain conditions such as urban areas, mountains and areas threatened by enemy fire.